I have just finished Catherine O’Flynn’s new book — it’s a corker. As the acknowledgements page makes very clear this book is not about Midlands Today, nor is it about Nick Owen (despite the theme of poor witticisms in local news bulletins). It’s not a book about Birmingham Central Library, nor its architect John Madin. It’s not a book about Birmingham, despite being set here (brilliantly evocatively without being cliquey). 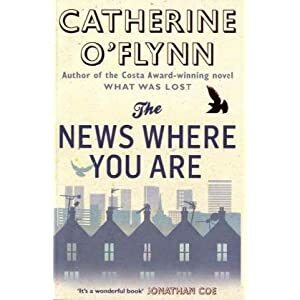 If Catherine O’Flynn’s first novel What Was Lost was about longing, The News Where You Are is about loss. Loss of loved ones, loss of the past, loss of hope for the future — and, more than that, the loss of past hopes for a future that doesn’t materialise. A future of pedestrian walkways and inner (and outer) ring-roads, of clean lines and surface. It’s not bleak, in fact it’s very human — for each loss there’s a new beginning, for each demolition a listing (or at least a stay of execution), for each problem as resolution of sorts. Except the standard of food in the BBC canteen. Frank Allcroft the novel’s ‘unfunniest man on God’s earth’ is a kind of Nick Owen, but he’s also Gordon Burns, Fred Dinage, Bob Warman and every other local celebrity that is comfortable rather than challenging — and of course he’s also not, because I’m sure none of the real presenters of England’s regional news programmes keep a note of all of the stories about lonely deaths and attend the funerals. It’s an expression of humanity and of localism and that’s at the core of the relationships we discover, despite being a book that features death at almost every turn it never becomes depressing. Emotional and sad, yes – but where it’s meant to. As a local you will spend time transposing the settings, picking apart Rhombus House back to it’s Alpha Tower and Central Library roots. The city isn’t a character in the the book, nor is it without its parallels and echoes to and of the narrative – the battle against our tendency to correct past mistakes by forgetting them is another theme. You’ll thrill to the (brief) ‘appearances’ of Telly Savalas and Herbert Manzoni, and it’s thoroughly enjoyable to read a grown-up and praise-worthy novel that’s set in the second city. If you’re reading this just as I post it, there’s a launch at the Ikon Gallery tonight. Richard Whitely is a good example of this sort of character that broke out of the Local News paper bag. Smashing review too!